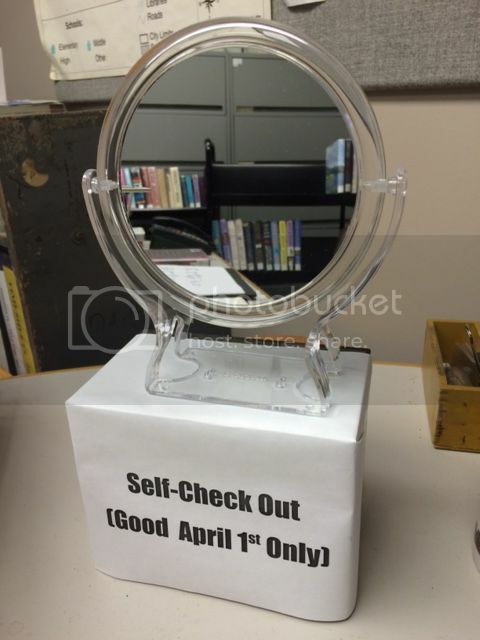 I thought we'd have a little fun at the library this April Fool's and had planned on putting out this "joke" self-check out. But, much like Google's April Fool's mic drop flop, it was not to be. Our real self-check out machine chose that day to go on the fritz - and a little joke like this might be funny, when you can point to the self-check just behind the patron and say, "Just kidding, it's right there," is NOT funny at all, when you've got to deal with troubleshooting a computer that's down. Rats. Maybe next year.